Delivering designs to the finest homes and businesses in the San Francisco Bay Area for 38 years. Quality products and service only means a quality staff. The synergy of our studio is filled with talent, passion, and positive thinking. We value the knowledge, support, and diversity each of our staff members have to offer. Every project regardless of scale displays our quality of work. It’s all about enjoying what you do and having fun. Our way of work has built a trustworthy and personable reputation throughout the San Francisco Bay Area. Our reputation is in your home and business. Thinking about hiring a designer? Get our free guide with tips on how to make the most out your first meeting! 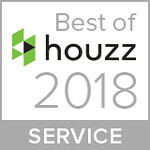 We won Best of Houzz: Service for a 4th consecutive year in a row! Thank you for your support! 925.820.9336 1499 Danville Blvd. Alamo, CA 94507 © 2019 J. Hettinger Interiors. All Rights Reserved.